Cate Blanchett showcase takes pretentious tedium to unheard-of levels. Long-lost missing member of Nirvana? 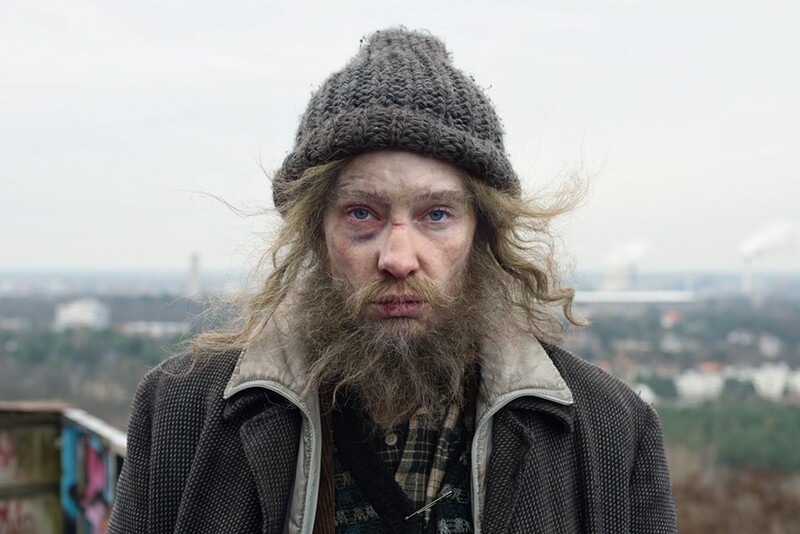 Nope, Cate Blanchett in Manifesto. Someone, somewhere must have decided it would be great to have Cate Blanchett, in a wide variety of makeup, costumes, and picturesque settings, get up and proclaim a series of ominous-sounding artistic-political mandates. The result is Manifesto, as tiresome an evening at the movies as any humorless drone could ever hope to inflict on an audience. Blanchett appears as a bearded street person, a frumpy recycling plant worker, a vitriolic mourner at a funeral, a middle-class American housewife serving dinner to her family, a cocktail party attendee in a burnt-orange sweater, a broadcast news announcer, a frantic broker on the trading floor, a rock musician complaining about her audience, etc. In every segment her voice is the main sound. Elaborate scene-setting is matched up with elusive and obscure speechifying, courtesy artist-writer-director Julian Rosefeldt. The locations are elaborate and wondrous – are they real or CGI? — but the intellectual harping (“Long live the great art vortex”; “We are still living under the reign of logic”) is hard to take after the surprise wears off. In one sense, it’s a worthwhile showcase of Blanchett’s actorly powers. But over the long haul Manifesto grinds us down. However curious we were to witness the interaction of the actress’ characterizing with the filmmaker’s pronouncements, the finished product resembles a non-stop commercial from hell. At one point in Blanchett’s ravings we recognize Lars von Trier and Thomas Vinterberg’s Dogme Manifesto. At that point we rest our case.